Last November during Picture Book Month, 31 picture book authors, illustrators, and book lovers were asked to share their perspective to answer the question -- "Why are picture books important?" The shared stories, memories, and opinions marked a daily celebration for picture books and a reason to be thankful for everything that they provide to us as readers. 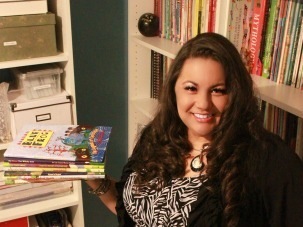 The success of the inaugural event can be credited to a supportive community of KidLit fanatics, but mostly to the incredibly organized and passionate founder, Dianne de Las Casas. Dianne de Las Casas began her career in children's literature as a volunteer storyteller at her local library. Her experiences at the library led her to become a professional storyteller. In an interview with the Love a Librarian Blog, she said, "Being a storyteller allowed me to 'season' my stories in front of live audiences. It helped me narrow my focus and specialize - audience participation is what I do best. This translates very well into children's picture books." Her first published books were geared toward teachers and librarians to help them develop the art of storytelling with titles like Story Craft: Crafting Story Theater Scripts and Handmade Tales: Stories to Make and Take. Then, in 2009 she published her first picture book The Cajun Cornbread Boy. I was astonished when I read in the School Library Journal, Practically Paradise Blog that she has visited more than 500 cities, 30+ states, and multiple countries as an author and storyteller. 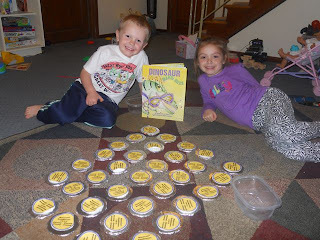 This week to celebrate Dianne de Las Casas' birthday we were chompin' and stompin' all week after reading her latest picture book Dinosaur Mardi Gras. The refrain from the book has been stuck in our heads and we couldn't help letting it out in the car, at the dinner table, and even before bedtime! The book taught us all about Mardi Gras, something we are sad to say that we knew very little about. We learned about krewes (carnival organizations that host parades), New Orleans street names, Rex: The King of Carnival, and even doubloons. In addition to learning about Mardi Gras we learned the names of numerous dinosaurs when we made our own Dinosaur Doubloons Memory Game. This week I learned that doubloons, coin-like favors thrown from floats in a Mardi Gras Parade, were first introduced in 1959 and made of lightweight aluminum. 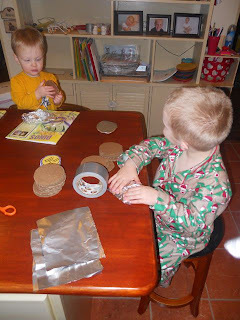 This gave me the idea to make our own out of cardboard circles and aluminum foil. In this picture, my oldest covered the cardboard with the aluminum foil while my youngest uncovered it. Let me tell you -- we are a very efficient crafting operation! There was some preplanning on my part. I cut out 34 cardboard circles about 3 inches in diameter (about double the size of the real Mardi Gras doubloon). Then, I found clip art pictures of the dinosaurs mentioned in Dinosaur Mardi Gras. All this cutting was completed the night before our game- making endeavor. I also learned that each doubloon is unique to a krewe, an organization that plans a parade, therefore each year there are many different doubloons. I chose to "brand" our doubloons with a purple and gold circle that read, "Dinosaur Doubloons 2012, Chomp! Chomp! Stomp! Stomp!" My son adhered the tape and placed the paper circle on the aluminum covered cardboard circle. 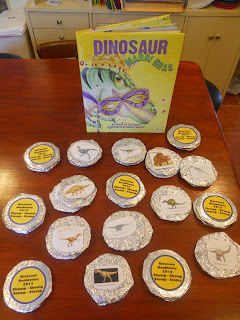 After the paper circles were taped on one side of the doubloon we taped our dinosaur images on the other side. We had two images of each dinosaur. The pictures of each dinosaur were easy to find using a Google Image Search. I wrote the name of each dinosaur under each image too. This is a photo of our completed Dinosaur Doubloons -- 34 in all! Some of the dinosaurs we had were Allosaurus, Spinosaurus, and of course the king, T-Rex. 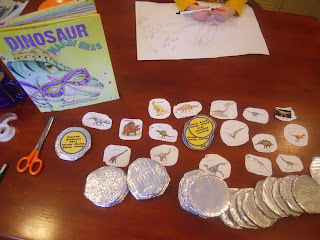 Throughout the day (and the next day) we played Dinosaur Doubloon Memory Game. We tried to find the matching pair of dinosaurs among the sea of dinosaur doubloons (Illustrations of Dinosaur doubloons also decorate the endpapers of the gorgeous picture book). It was cool to hear that the dinosaur names become comfortable vocabulary for my children after playing the game. Dianne, thank you so much for sharing your birthday thoughts. We hope you have a wonderful time in New York City. Happy Birthday! We admire your efforts with Picture Book Month. Good luck with the project. I have not seen Tangram Tales. I tried to get a hold of some of her other teacher books but it didn't work out in time for the birthday celebration. I have to confess that I haven't read any of Dianne's books yet, but I've read a number of rave reviews about her books - I really should go check out her picture in our library. I also have a special fascination for reading stories aloud and I am glad to resonate with that bit from Dianne's history - I still do it with my ten year old daughter and I do it as well with my adult students in the university (preservice teachers/inservice teachers) - and the latter find it amusing whenever I read picture books aloud - but I have a sense that they like it too. 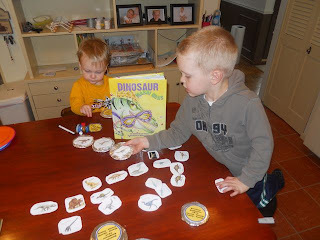 And yes the dinosaur memory game looks like so much hard work on your part! But wow, these are priceless moments spent with your kids. I'm sure they enjoyed it a great deal. :) Nothing beats a homemade game. Thanks Myra! Dianne's books were new for us too. I think we are going to be hearing a lot about her in the years to come. 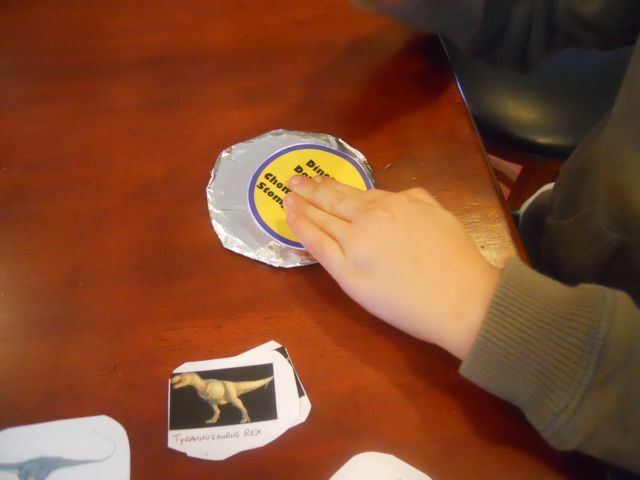 The dinosaur memory did have more prep than my other activities, but the kids loved it. They were still playing it days after the birthday celebration. This book looks fantastic, I am sure my kids would love it. The doubloons are a great activity!! Thanks for sharing. Thanks Medea! I think your kids will love the book! Kerry, I hadn't read books by Dianne before celebrating her birthday, but I also learned of her through Picture Book Month. I love how her picture books include movement and interaction!